Combined drying and grinding. Watch animation. Gentle drying and grinding through a combination of drying, grinding and inertial separation in one working area of dispergator. Watch animation. Perfect drying efficiency - material is constantly under the "perfect drying." Inertial separation – material particles of required size and humidity characteristics are taken drying-grinding area out. Watch animation. 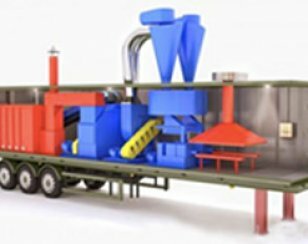 Drying process fire safety – sparing heat-carrying agent temperature, possibility of drying through intensive mass exchange with little heat-carrying agent temperature. Compactness (overall dimensions of drying unit are 2000х1600х1600 mm) and consequently low steel intensity. Low total energy consumption (heating and electricity) per 1 kg. evaporated moisture. Staff – energetic and skilled staff, with good knowledge of materials and technologies. Experience – our own pilot production. Supporting–research laboratories and institutes of higher education supporting. Comprehensive approach - Parmatech specialists render the whole range of services and operations, which includes: designing and production of equipment; contract supervision and commissioning; maintenance staff training; warranty and post-warranty services. Focus on a client – We are proud to have careful examination of each investment project conditions as the beginning of our service package organization. The aim of every our project is increasing efficiency of Client activity and improving his output. All-inclusiveness – The aim of every our project is increasing efficiency of Client activity and improving his output. We offer warranty and post-warranty services, and we are always ready to train and give complex consultations. Responsibility – Awaring of responsibility for clients, our engineers always work on improvements and new solutions search to be sure, we offer modern technologies. Mobility – Parmatech solutions are extremely mobile, our container-type miniplants can be installed on draft chassis, that allows to start production promptly and transport it to center of raw material resources location. Efficiency – the combination of time-tested technologies and unique equipment allow our solutions to work more efficient and reliable. Ecological compatibility – all offered solutions secure environment preservation through using innovation technologies and allow to increase efficiency of processing natural resources.